This Chinese spring roll appetizer stuffed with vegetables is easier to prepare than you might think and can be made vegetarian and vegan if vegetarian oyster sauce (made with mushrooms) is used. 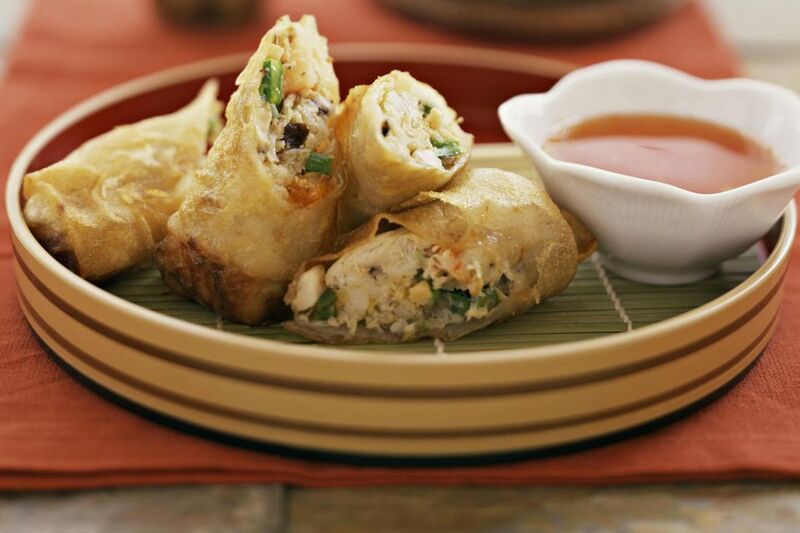 How did spring rolls get their name? This delicate, but filling appetizer has its origins in the annual Chinese Spring Festival. The first spring rolls featured fresh vegetables from the harvest; meat was added later. Note: while there are multiple steps to this recipe, these spring rolls are broken down into workable categories to help you better plan for preparation and cooking. About 30 minutes before assembling the filling, rinse and drain the mung bean sprouts to give them time to dry thoroughly. Soak the Chinese dried mushrooms in warm water to soften (20 to 30 minutes). Squeeze any excess water out of the mushrooms and thinly slice. Dice the red bell pepper. Grate the carrot and finely slice the bamboo shoots. In a small bowl, combine the oyster sauce, chicken broth or water, soy sauce and sugar. Set aside. Heat 2 tablespoons oil in a frying pan, swirling so that it coats the pan. When the oil is sizzling, stir fry the vegetables, starting with the dried mushrooms, followed by the bamboo shoots, bell pepper, mung bean sprouts, and grated carrot. Stir in the sauce ingredients. Taste and season with salt and freshly ground pepper if desired. Remove from the heat and cool. To make the spring rolls, lay a wrapper in front of you so that it forms a diamond shape. Brush the edges of the wrapper with the lightly beaten egg. Place 2 tablespoons of filling in the bottom half, spreading it out sideways to form a rectangle shape, but not touching the edges. Lift the bottom corner of the wrapper and tuck it in under the filling. Fold over the left and right sides of the spring roll wrapper. Continue rolling up the wrapper. When you are almost finished, lightly brush the edges of the top corner of the diamond with the beaten egg mixture, fold over and seal. Heat oil for deep frying to 360 F. When the oil is ready, carefully add the spring rolls, a few at a time, cooking until they are golden brown and crispy (3 to 4 minutes). Remove and drain on paper towels. Serve with plum sauce, hot mustard, or sweet-and-sour sauce.